Norrora was a Norwegian newspaper published by P. M. Dahl and I. Olsen using an amount of $3000 subscription from Canadian Norwegian community in Winnipeg, Manitoba. From 1910 to 1920s, it was a newspaper that supported the liberal party. Norrora was a weekly newspaper from 1910 to 1966. 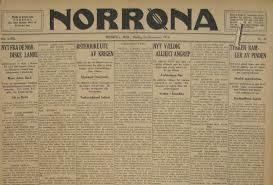 From 1967 to 1920, Norrora became a semi-monthly newspaper before it moved to Vancouver. In later issues, Norrora also published some of its content in English. Dahl , P. M.; Olsen, I.
Dahl, P. M.; Olsen I.